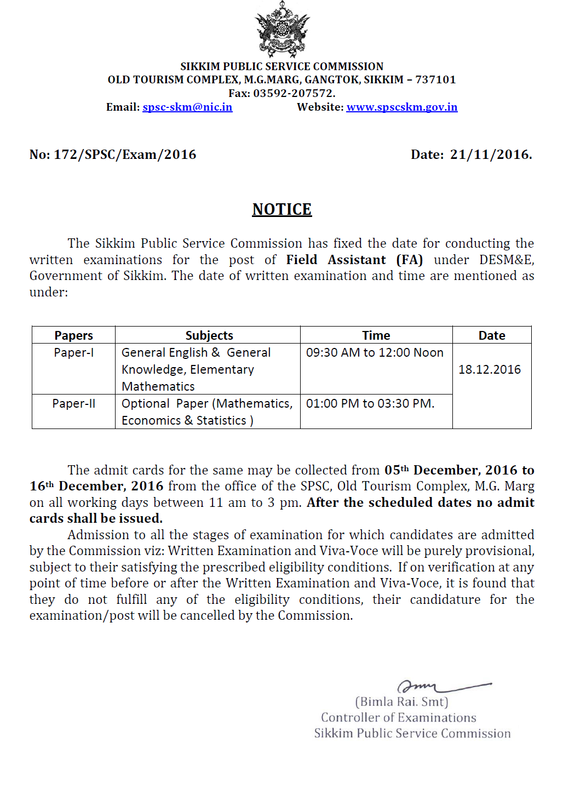 Sikkim Public Service Commission (SPSC) will organize Field Assistant (FA) written examination on 18.12.2016. The test is held for the post of Field Assistant (FA) under DESM&E, Government of Sikkim. Now latest update is that SPSC FA Exam Admit card are going to be available from 05 Dec 2016. The admit cards for the same may be collected from 05th December, 2016 to 16th December, 2016 from the office of the SPSC, Old Tourism Complex, M.G. Marg on all working days between 11 am to 3 pm. The written exam will be held in two sessions i.e. from 09:30 am to 12:00 noon and 01:00 pm to 03:30 pm. 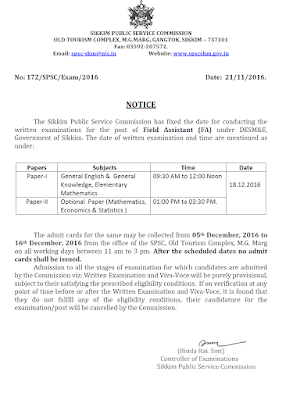 The admit cards can be collected from the office of Sikkim PSC as per the time mentioned above from 05 Dec to 16 Dec 2016. There will be two papers. Paper 1 is having subjects General English & General Knowledge, Elementary Mathematics while paper 2 is having subjects Optional Paper (Mathematics, Economics & Statistics ).